GILBERTOWN – The Alabama Department of Labor / Alabama Career Center System is proud to announce the grand opening of its 50th Career Center. 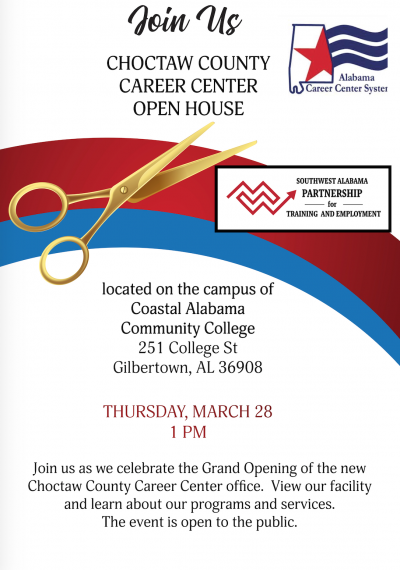 The Choctaw County Career Center Grand Opening will be Thursday, March 28 at 1:00 p.m. The new center is located at 251 College Street in Gilbertown. The center will be open Wednesday from 9:00 a.m. – 3:00 p.m.
Services available at the Career Center include: résumé assistance, interview preparation, job search assistance, educational and vocational assistance, and much more. For employers, the Center offers employee pre-screening, free job postings, and assistance in obtaining tax credits. “We’re proud to round out our number of career centers to an even 50! We hope to be able to serve as many Alabamians as we can, and this addition in the South Alabama area is a welcome one,” said Fitzgerald Washington, Secretary of the Alabama Department of Labor.